The Leica DISTO D2 with Smart Bluetooth technology is the latest model available in the Disto family of laser tapes. As small as a mobile phone this new tool will prove an ideal solution to any customer. Shortcut keys for addition, subtraction, area and volume calculation make measuring fast and very reliable and the last 10 measurements are also stored. As with all Leica laser distance meters, the laser dot is clearly visible. You can always see your targeting point, even if the target object is in a hard to access area. Leica DISTO™ D2 – you will never use a measuring tape again! Easy to use out of the box. The free Leica DISTO™ sketch app connects your smartphone or tablet to your D2 allowing you to capture measurements and create sketches, generate floor plans or add dimensions to photos. The Disto D2 includes a Leica's smart end-piece which auto detects the position it is in and includes this in your measurement. This allows accurate measurements from corners and edges of objects. 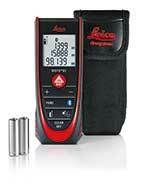 Every D2 comes with a calibration certificate and as it a ISO-certified Leica DISTO™ you can be sure, that accuracy and range stated on the package can be achieved on a construction site unlike other manufacture’s.